The Eagles and Giants square off once again this Sunday night at Lincoln Financial Field. This rivalry has always been entertaining and it goes way back to Chuck Bednarik standing over Frank Gifford in that infamous photo to Herm Edwards scooping up Joe Pisarcik’s fumble for the Miracle at the Meadowlands to Brian Westbrook’s 2003 punt return to give the Eagles the lead with less than 90 seconds left for Miracle at the Meadowlands Part 2. Most recently, and probably the most fun, was the Eagles Miracle at the New Meadowlands on December 19, 2010 when they scored 28 unanswered points in the final 7:28 to beat the Giants with the highlight being Desean Jackson’s punt return with no time left on the clock which all but sealed the Eagles NFC East Division title. The Eagles have had the upper hand in these scenarios but the Giants have had the last laugh. Since 2001, the Eagles are 16-8 against the Giants but, over that same time period, the Giants have won two improbable Super Bowls over the New England Patriots. In their last eight head to head matchups, the Eagles have won seven with their only blemish coming in last year’s home opener in which the Eagles blew a fourth quarter lead to G-men. There is a lot to hate about the Giants: from Tom Coughlin’s constant whining to Osi Umenyiora and LeSean McCoy’s war of words to the New York media constantly shoving Eli Manning down your throat (although Eli himself is difficult to hate) to punter Steve Weatherford’s trash talk about the city of Philadelphia. To say that the Giants are not liked in the city of Philadelphia is probably an understatement. One thing that we, here in Philadelphia, don’t often see is the other side of the rivalry. Jenny Vrentas of the Newark Star Ledger looked at the Eagles – Giants rivalry from the Giants point of view and uncovered things that were not surprising and some things that you might have forgotten about. The Giants don’t really like the Eagles either. Remember in the playoffs in January 2009, while the Eagles were en route to a 23-11 upset of New York in the NFC Divisional Round, when Donovan McNabb scampered out of bounds and picked up the phone on the Giants sideline? Well the Giants remember that too and, shockingly, they didn’t like it. Vrentas points out that they still hold a grudge about Desean Jackson flipping the football to defensive coordinator Perry Fewell during last November’s 17-10 victory at MetLife Stadium in which Vince Young (yes, the same Vince Young) led Philadelphia down the field for the game winning score. The Giants also remember other moments against the Eagles like in 2007 when they sacked Donovan McNabb 12 times (Umenyiora had six by himself) on national television. Vrentas says according to Giants defensive end Justin Tuck, the Eagles have “tried to block the crap out of us since.” After all of this, the two memories the Giants have came on Sundays in February 2008 and 2012. As much as the Eagles have handled the Giants recently, the ultimate goal is to take home the Lombardi Trophy and Eli Manning has led the Giants to that moment twice in his career. The Giants were there and the Eagles were watching at home. 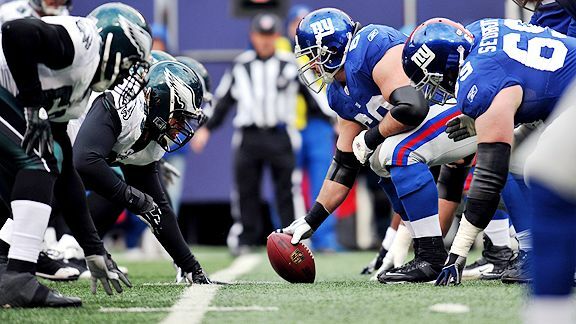 This Sunday is the first time the Eagles face the Giants since their stunning Super Bowl run. There is no doubt the Eagles have a little more anger in them this week than against other opponents because had the Eagles not blown one fourth quarter lead last year the Giants wouldn’t have even made the playoffs. But that didn’t happen and the Giants not only made the playoffs, they won it all. The rivalry is sure to heat up even more on Sunday and hopefully the Eagles are the ones who walk away with the win and, maybe in February, with the Lombardi Trophy.